Aventura motorcycle accident injury victims need legal advice before taking any steps toward getting compensated for their injuries. If you were injured in such an accident, you can expect to be offered a settlement, but that may not be the compensation you deserve. People and insurance companies don’t want to pay for damages and might see it in your case. However, with the advice and support of a Miami personal injury attorney, you can get the recovery you deserve. Recovering is not a straightforward task. We have helped injured victims for more than five decades. We invite you to contact our Aventura motorcycle accident attorneys at the Wolfson Law Firm. Call us at 305-285-1115 for free consultations and let us help you after your Aventura motorcycle accident. Aventura is named after the Spanish word for adventure, as one of the developers of the city remarked to others: “What an adventure this is going to be”. The adventure began in 1970’s when the city was initially named Turnberry. However, it was incorporated as Aventura in 1995. Aventura is the home to the Aventura Mall, the fifth largest shopping mall in the United States. Apart from the iconic mall, the city hosts several recreational parks, water parks, and golf courses. There are more than 36,000 people living there. Even though the name is of Spanish origin, Hispanic-Americans make less than one-quarter of the total population. 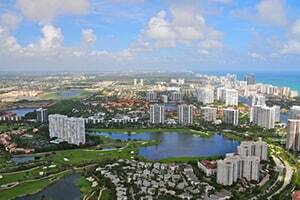 It is located in northeastern Miami-Dade County, and is surrounded by Hallandale Beach, Golden Beach, Sunny Isles Beach, Ojus, and North Miami Beach. If you happen to have suffered injuries in any of these accidents, or any other motorcycle accident in Miami, you should know that you have the right to claim damages from those responsible for your harms and losses. You may get compensated for your medical bills, lost earnings, scarring, emotional pain, and other injury-related losses and expenses. Make sure you investigate the circumstances of the case very well. Insurance companies may be quick to offer you some kind of compensation, but that’s rarely what motorcycle accidents are worth. That’s why you need an experienced and aggressive motorcycle accident lawyer in Miami to fight for your rights. Our Aventura motorcycle injury attorneys at the Wolfson Law Firm have 50 plus years of experience in helping the good people of Aventura after a motorcycle accident. Call us at 305-285-1115 for free consultations and let’s get to work. You won’t pay any fees until we recover for you.